The Wabbit crouched on the window ledge and listened. Then he heard that strange sound again and he looked down at Lapinette. Lapinette made a sign with her paw and the Wabbit heard her rack a round into the chamber of her automatic. He touched a button on his laser gun and listened to the whine as it charged. 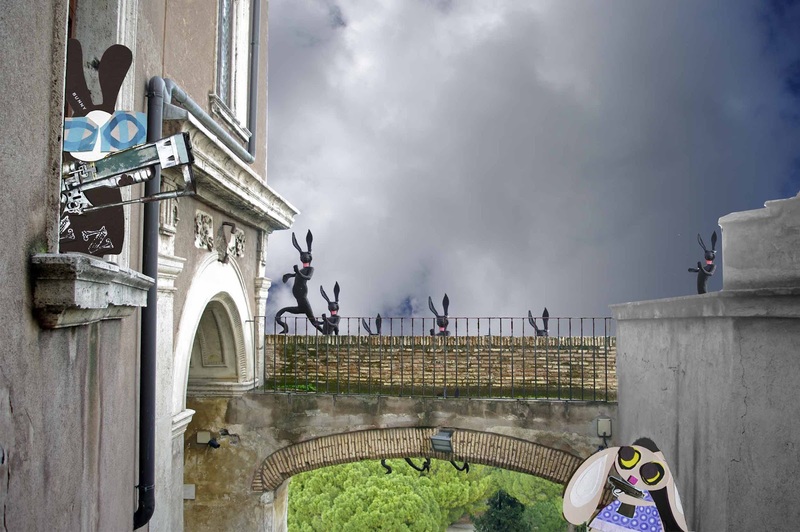 The Wabbit risked a glance round the wall and spotted several agents of Rabit scale the castle bridge and make their way along the ramparts. He strained his ears to the utmost. Yes, there it was again, nearly inaudible - but it was there. Snicker-snacker, snicker-snacker went the sound. The Wabbit switched on his universal translator but the sound was more or less the same. "Snacker-snicker, snacker-snicker," chattered the translator. "I wonder why the wranglers never worked out this signal?" thought the Wabbit. Lapinette made a sign with her paws and twitched her ears seven times. "There are seven agents," thought the Wabbit. "That’s three and a half each." Lapinette made another sign. "Seventy!" thought the Wabbit," and he wiggled his ears back and to each side. Lapinette shook her head and twitched her ears once more. "Seven elite troops," thought the Wabbit. "That’s still three and a half each, but harder." So the Wabbit changed the setting on his laser and it started to whine quite loudly. Lapinette frowned and covered her mouth. The Wabbit shrugged his shoulders and shook a paw at his weapon. Lapinette twitched her ears again and nodded her head down. "Go down to the back," reckoned the Wabbit. Lapinette made a scissors motion. "And cut them off ...?" guessed the Wabbit. Lapinette blew him a kiss. "At the pass!" realised the Wabbit.